Measuring Tomatoes—How Many Are in a Pound? When your recipe calls for a pound or a cup of tomatoes, it's good to know how many you will need before you start cooking. Or, maybe the recipe calls for canned tomatoes but you only have fresh, so you need to know the equivalent for a 28-ounce can. Luckily, there are methods for converting tomatoes from amount to weight, or fresh to canned. Charts laying out the equivalents of whole tomatoes to weight, whole tomatoes to cups, and canned to whole tomatoes and cups will make these conversions quick and easy. This chart converts amounts of different tomatoes to weight—perfect when your recipe specifies pounds and you need to know how many to buy or pick from your garden. Keep in mind that there can be variance and get an extra tomato or two if the ones available seem to be on the small side. The next step is to convert weight to cups of chopped, pureed, or cooked tomatoes. This chart will help you find the equivalents. Perhaps you made a last-minute decision to make a certain dish that calls for canned tomatoes, and you only have fresh tomatoes in the pantry. Or the recipe calls for cups of tomatoes and you are going to use canned. Not to worry—this chart will sort it all out. Whether it is a question of servings or how to substitute tomato sauce, these conversions will help you out in the kitchen. 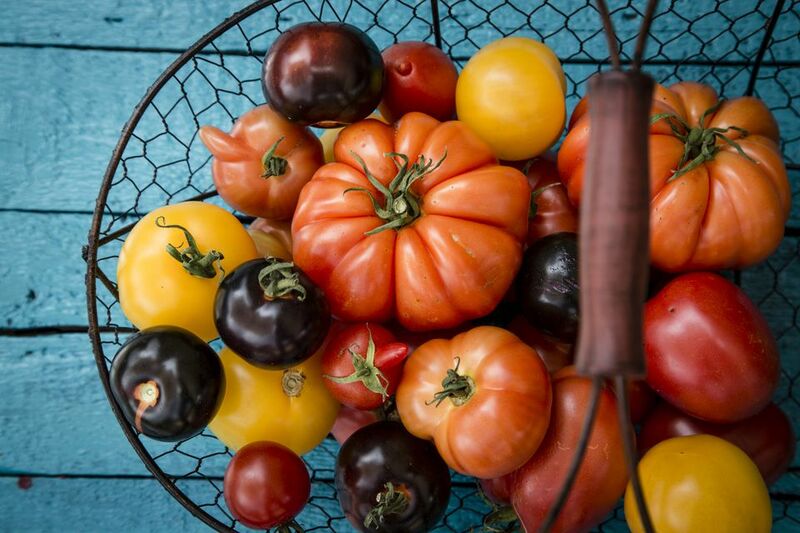 Nowadays there are so many choices of types of tomatoes in the supermarket—cherry, grape, yellow, heirloom, vine-ripened, Campari, Kumato, beefsteak, and Roma, to name just a few. But no matter which variety you pick, it is important you know what to look for to assure that you're getting the best quality. There are three ways to determine whether a tomato is worth buying: appearance, feel, and smell. First, you want to look for tomatoes that have a deep, bright red color. Those that are "vine-ripened" may be your best bet since most tomatoes are harvested when still green and left to ripen in transport, which results in a pale, bland-tasting fruit. Also, check for any blemishes such as black spots—they may seem like nothing, but they could signal that the inside is rotting. Next, hold the tomato—you want it to feel heavy in the hand. A tomato with a bit of weight means that it is ripe and nice and juicy inside. Then give it a gentle squeeze. How much give is there? You want it to resist but not feel rock hard. Of course, you also don't want it to be a pile of mush. The last step is to take a whiff. If you don't smell anything then you probably won't taste anything. You want the tomato to have an earthy, sweet aroma that is somewhat strong. If the tomatoes are packaged in plastic wrap or containers touching and smelling will be impossible. If you can, avoid buying tomatoes that are pre-packaged, but if they are your only option just do the best you can.